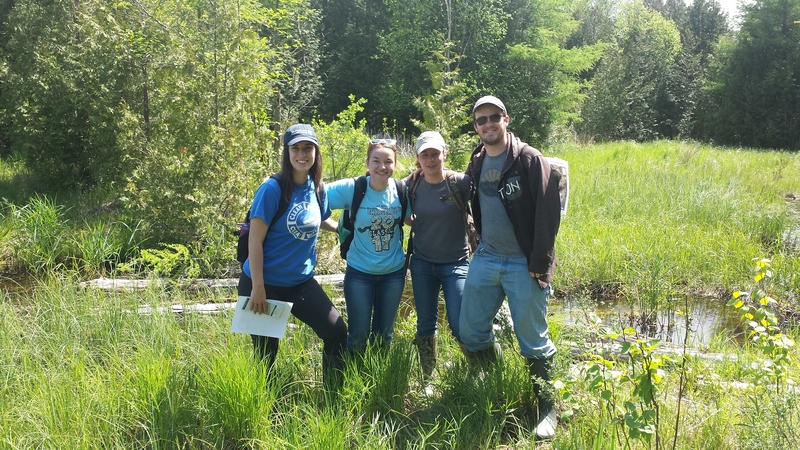 This four-person crew spent part of their summer mapping invasive species in preparation for a restoration project to begin in 2018. Door County Land Trust’s Three Springs Nature Preserve is one of several sites prioritized in this partner project to map, monitor and reduce invasive species within Wisconsin’s Door Peninsula Coastal Wetlands Ramsar site, an 11,443-acre wetland complex designated as a Wetland of International Importance by the Ramsar Convention in 2015. The health of the wetlands at Three Springs Nature Preserve is threatened by invasive plant species including reed canary grass, buckthorn, and European marsh thistle. The restoration of this site will help ensure this natural area can continue to support the diverse plant and animal life found here, including habitat for the federally threatened Hine’s emerald dragonfly. Many thanks to The Nature Conservancy for spearheading and managing this partnership project made possible by a grant award from Sustain Our Great Lakes (SOGL). Aerial photo of North Bay and Three Springs Nature Preserve by Dan Eggert.